It’s an off-week, so Van and John roll out a potpourri of observations and arguments, looking back at the Georgia game and forward to the next two big ones, to tide us over for a couple of days. Cam Newton is a quarterback, too. * Victory over Georgia. Sweet indeed. Living in Atlanta from 1995 to 2006, I came to appreciate the glorious feeling that comes with knocking off to the Dawgs. Previously, having grown up in Alabama, the Georgia game never meant all that much to me. Eleven years in Georgia and I totally got it. When you hear Auburn players who grew up in Georgia say how much it means to them to beat the Dawgs—believe it. * What, chicken again?! Playing Florida in Atlanta would have been satisfying in so many ways. There’s the history angle: In our second appearance in the Dome in 2000 we faced the Gators, and it wasn’t close or pretty. Just as we got the chance to even the scales with Tennessee in 2004, paying them back for 1997 (I still cringe, thinking about Manning-to-Price late in the fourth), it would have been fantastic to get the chance to balance the books with Florida. There’s also all the stuff floating around lately about Urban Meyer’s possible role in the Newton imbroglio. Finally, there’s the prestige (and the pure fun) of smacking down Florida, and possibly ringing them up for a third loss to us in a row. Indeed, it would have been joyous. Alas, instead we get a heaping helping of reheated chicken on the artificial turf. A team we’ve already taken down once. It’s almost always tougher to beat a team a second time in the same season, as Tennessee demonstrated in 2004 by giving us something of a struggle in the Dome, after we’d absolutely taken the lumber to them in their own house earlier that fall. So it’s sort of disappointing to miss out on a shot at the Gators—and if you ever wanted to play them, this is the year. At least we get the satisfaction of facing our old and respected foe, Steve Spurrier, one more time. Every time we hang an “L” in his ledger, it makes up (somewhat) for that abominable run we had against his Gators between 1995 and 2000. No, it’s never a disappointment to have to face Steve Spurrier. And I have no doubt we will have our work more than cut out for us in the Georgia Dome on December 4. And let’s face it—a win over anybody from the East, if it comes in the Dome and they’re the other division’s representative in the Championship Game, means an SEC Title for us. And that’s all that really matters. Overwhelmingly pro-Cam, completely unsolicited. They love him. but, honestly, doesn’t it feel more like the other way around? Perhaps the key phrase in whatever legal wrangling will eventually settle the Newton controversy. As Bill Clinton might say, it depends on what your definition of “behalf” is. Some might argue that for one person to act on “behalf” of another, there would have to be a knowing connection—that you’re doing something for someone because they asked you to, or at least that you are aware of it. If Cam wasn’t aware of and didn’t request for Cecil to ask for anything, was Cecil really acting “on behalf of” Cam? Especially if Cam was a grown man by that point, and not a child, whose parents sort of automatically act on kids’ behalf? This could be the sticking point upon which any eventual NCAA ruling hinges. * Man, Eric Smith blocks so well. On the next to last touchdown in the Georgia game—the second pass to Lutzenkirchen—Smith blew up the UGA defensive end so Cam could have time to throw the ball. It was so well-designed, too: the whole play flowed to the right, and Smith even started out in the fullback/h-back spot on the right side of the formation. But when the ball was snapped, he ran left (even as nearly every other Auburn player was moving right) and completely walled-off the DE. Beautiful. * It’s okay, Coach Grantham. Nobody else has been able to figure out how to stop us, either. Good for ’em in 1986; probably wouldn’t have hurt this time, either. The only thing from Athens that stinks worse than a wet Dawg. Keeping that happy post-victory buzz going for another 24 hours. “Fairley would be a rock star in Georgia if he played for the ‘Dogs. But he plays for Auburn. So we hate him. I get it.” ‘Nuff said. * Les Miles is already lobbying to get LSU into the BCS Title Game. No, I’m not kidding. He’s making that argument. But—just imagine if Oregon and TCU and Boise State all lost before the end of the season. You say it would defy the laws of physics and of nature? Exactly. This is Les Miles we’re talking about. —scary enough to make everyone apparently forget how Auburn handled them, when our offense wasn’t as proficient as it is now; and perhaps more significantly, just how thoroughly Arkansas blew them out only a little over a week ago. Our degree of concern should be at a healthy but not irrational level, heading to Atlanta. * Anyone else see Oregon trying to play more like Auburn on Saturday? Their final drive, keeping the ball out of Cal’s hands for something like nine minutes, was strangely reminiscent of our last drive against Kentucky. Oregon likes to brag that they play super-fast, all the time, but now we know that they can also slow it down and grind it out—if it’s that or lose. A couple of Long Island Teas and a ride on a Tilt-a-Whirl < raw pork chop served in a dirty ashtray < whining Georgia fans. = Less talk about Cam Cam Cam. At least for the first part of this week. Finebaum. Dredging up old Cam stuff from Friday, all day long on Monday. And then wall-to-wall Fairley, all day on Tuesday. What did we expect? who actually covered the game live for CBS, and then re-watched it on television afterward—and pretty much sided with Fairley on every point other than the flagged late hit (which no rational Auburn person has defended). His only critique was to suggest Chizik should have called a timeout to remind his players that they shouldn’t do anything of a retaliatory nature that might endanger their playing status for the next opponent, since it’s Alabama. Wow—what a stinging indictment of Auburn’s behavior. I can’t imagine how Georgia fans must have reacted. who agreed on Wednesday morning that Fairley is not a “dirty player,” echoing Danielson almost exactly. Almost made me want to take back the Barry Switzer/cocaine/machine guns in the dorm insults I was hurling at my TV on Saturday during the studio segments. –is now no longer us! In the Georgia game Fairley made several plays that angered the UGA team. In the first quarter with the score 14-7 and UGA near midfield, he hit Aaron Murray straight on and drove him into the turf. (Several times this year Fairley has picked up the opposing quarterback and spiked them into the ground, landing on top of them.) Again, this is a penalty in the NFL but not in college. Go change the rules if you don’t like it. I love Nick Fairley and I hope he wins the Outland and Lombardi trophies but we all know he took some cheap shots at Murray he did not need to. And that is what helped cause the riot at the end. However, the other part of it, that UGA will never admit, is that Richt came in and told his team “You can’t back down—you have to hit them in the mouth and get inside their head” and they did that to us in the first quarter. But after we settled down and played our game, that didn’t work anymore—it only contributed to the growing bad feelings [which the refs didn’t do much to control, either—Van]. There’s also the fact that all these guys know each other and the Auburn guys who are from the state of Georgia were tired of losing to UGA, and their frustrations showed. 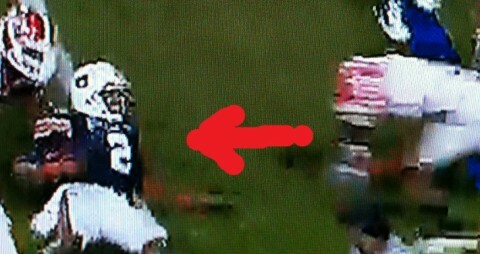 The worst part is that all of that silliness above causes Goggans and Blanc to miss the first half of the Alabama game. And we freaking need them. I guarantee this: Chizik ripped the team into little pieces on Sunday. He was not happy. In his defense, Fairley was both chop-blocked and held regularly in the game. Not that either did UGA any good in stopping him. The one play I thought was the most egregious (sorry – for the Bama fans reading this, that means “over the line”) was the hit near the goal line when Fairley speared Murray in the back after the ball was thrown. This was flagged as a penalty and rightfully so. At the end of the game, UGA had the ball near midfield with 2:03 left in the game, down 18 points. Mark Richt could have called a running play and gotten on the bus and gone home. Instead he called a fifty-yard pass that required his talented young quarterback to take a seven step drop and hold the ball, against a defensive line they’d had problems blocking all day. 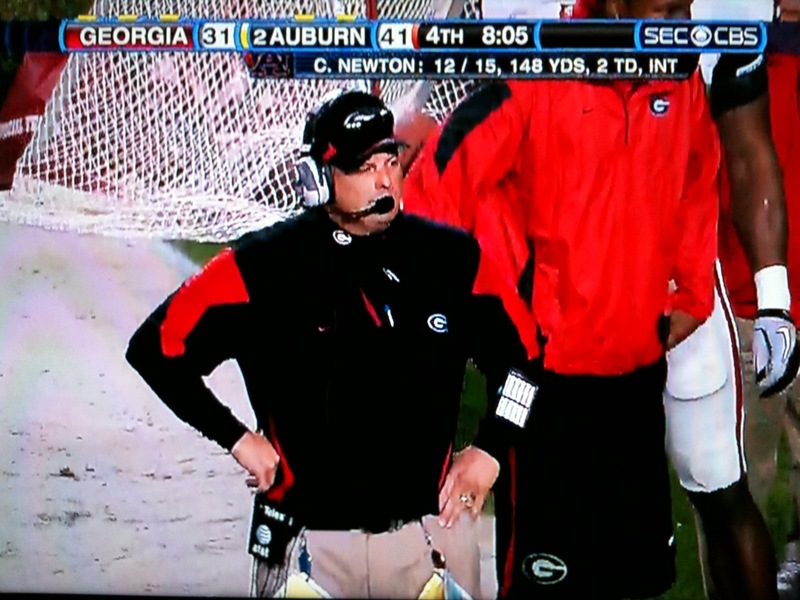 The game was over—UGA’s chances of coming back and winning at that point were about one in a billion. Are those odds worth risking the best young quarterback in the SEC over? No – but Richt did it anyway. To me, there is no difference between this play and the Tyrone Prothro play: in both cases the game was over but the head coach refused to acknowledge it and someone got hurt because of that. But do you know what else Nick Fairley is? He is intimidating. SEC quarterbacks are afraid when they play Auburn. Their eye level drops from looking down the field to trying to find Fairley. They worry about where he is and what he’s doing and this impacts their play. So do you know who is whining and crying even more than the typical Georgia fan this week about Fairley? The typical Alabama fan. After watching Drake Nevis puree the center of their offensive line they are scared of seeing Nick Fairley making regular and unwelcome visits to their backfield on Friday afternoon. And here is the real danger for Auburn fans. All this whining—all this crying about dirty play—is serving to push the refs into looking much more carefully at Fairley, and being potentially much more likely to flag him for more penalties. Others (particularly Tony Barnhart) have noted that exact factor this week, particularly after the SEC reviewed the game tapes and opted not to further penalize Fairley. But the very fact that they felt it necessary to announce that he wasn’t being penalized shows just how closely they’re looking at him. Nick Fairley is a defensive lineman. His job is to get into the backfield and tackle the ball carrier. If his target is the quarterback, he wants to hit the guy so hard that he is intimidated and will be more likely to throw the ball away later on. 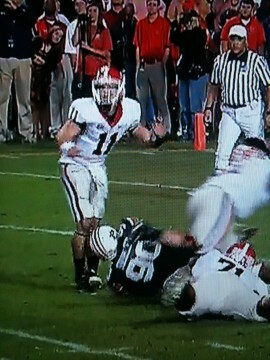 If Fairley commits a penalty in the process of his work, the refs should call it. Otherwise, the whining fans should shut up and sit back and prepare to watch him crush the Bama quarterbacks, like he has done to everyone else this year. which he believes speak for themselves. The first shows the “vicious hit” by Fairley near the end of the game, which resulted in the Georgia players emptying their benches and storming the field, even as three Georgia players were holding Fairley down and working him over. I’m still trying to figure out how a guy who is lying face-down on the turf, at the feet of the quarterback (who is still standing perfectly straight and only gets hit by the helmet in passing) is guilty of something malicious here. Now here’s a play that happened earlier in the game. Cam Newton (also a quarterback!) has slid to end his run. Observe where the Georgia defender is, to the right in the picture, and what he’s doing: lowering his helmet and charging at the already-sliding Cam. He’s still like three steps away at this point, too. 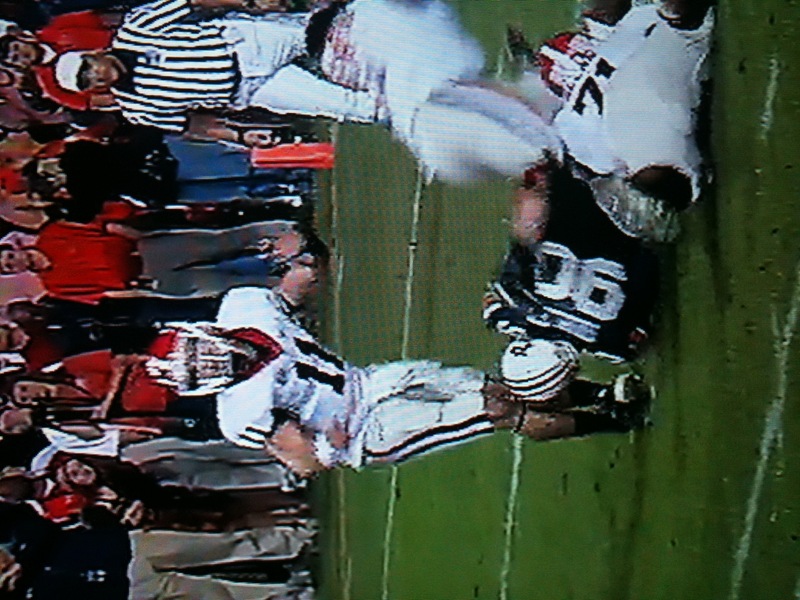 The sequence ended with the UGA player spearing Newton. Nothing was flagged here, of course. * Auburn’s players lost their composure twice on Saturday—at the beginning and at the end. If they do that in any of the next three games, we lose. It cannot happen again. * Bama is the most complete team we will play all season. They are very good at everything—not great at any one thing but, unlike other teams we have played, they don’t have a single real weakness. We will just have to go in there and outscore them. Did you see Saban chewing out the backup quarterback when they were up 30-3? He knows what is coming on November 26 and he knows that his team will have to play great to win. And the crowd in Bryant-Denny will be insane from the pre-game on. This is Auburn’s toughest game of the year and no mistake. * Cam showed something on Saturday in the passing game. The throw he zipped down the middle to the Swede Killa for a touchdown was an NFL throw. He made two or three other throws that must have had NFL scouts saying “Yes!” That was the best he has thrown the ball all year, even with the two huge drops in the first half. * Aaron Murray is a very good player and he is going to torment us the next three years. He’s the best young quarterback in the conference. * If we can stop the run we can beat Bama. That is the key. Last year we stopped the run but could not score enough. This year we can score plenty. So Bama will try a ball control approach and keep it away from us, limiting the number of possessions in the game, the way LSU did. We have to get it back in the hands of our offense. * I love how Malzahn puts a few more cards on the table every game. Against Georgia it was the unbalanced line thing (complete with hurry-up to the snap, to disguise it). And it was really nice. So now Alabama has to prepare for that as well as everything else…except that you just know Malzahn has five or six more cards up his sleeve just for that game. The best part of that second still frame… Cam has a big fat grin on his face. Love it. With more attention on Fairly comes more attention on the OL trying to block him. If … excuse me, WHEN they can’t stop him their holding and chops will light up the field with yellow hankies. how about the statue of liberty play against Georgia?! too bad it was called back for holding. you gotta know Gus has something even better for Bama! If 71 was blocking Felony to the right, to the outside of the frame, how did he end up back at the QB? All of this overlooks by far the dirtiest play of the game, when Felony dug his facemask into Murray’s FACE in an attempt to cut him up? The prison team from The Longest Yard was impressed by that. All good except for one thing I have to nitpick: the unbalanced line is hardly new, Gustav has run plays from it in every game. tywebb, you are truly delusional; we used to refer UGA as a bunch of “puppy dogs”, now it would be more appropriate to change those middle Ps to Ss. What a bunch of whiny leg-humpers. There’s aslo a play, somewere around the end of the third quarter (I think that’s where it is) where Fairley is trailing the play, and a GA running back is tacked near the sideline. He’s several yards away and is slowing down when one of the UGA offensive linemen comes in from the side and dives at Fairley’s knees. Luckily he is athletic enough and aware enough to jump over it and the lineman rolls under. I’d like to see a still of that one as well. tywebb, on a play earlier in the game very similar to the one where Murray’s knee/leg was banged, Failey gets through and wraps his arms arround Murray’s thighs and brings him down causing the pass to be incomplete. With Murray dropping back to pass again late in the game, Fairly is attempting to do the same thing, gets pushed, loses his footing, and rolls into the leg. The only difference in those two plays is in one he keeps his feet under him, the other he’s not able to. And on the other play you mentioned, in case you never played football, that’s called a form tackle. Face mask in chest, wrap arms around, and run through. He was not picked up or slammed. I realize in todays game you are probably used to seeing shoulder tackes, but form tacking has been a fundamental of football for a long, long time. UGA’s semi-official whine video – aka the greatest AU highlight Video EVER!!! The screen shots are great. I agree with all of the Fairley calls. UGA might as well be the new-age Miami when it comes to their players acting unsportsmanlike. That YouTube clip is (unintentionally) hilarious. Thanks. One of my favorite post-game comments came from a UGA blogger who said the game wasn’t as close as the final score indicated. Considering over the last three quarters we outscored them 42-10, I’d say that, to the contrary, it *wasn’t as close* as the score indicated! I can tell you, living in Bham, I have never seen bama as nervous as they are right now. They say they want cam in because they want to beat the best, but they are praying Cam is out and all they do is call to petition the local radio show about suspending Fairley. I think this fall from grace was too hard for them. They are breaking. It is funny, but sad at the same time. Doug, that was both moving and beautiful. UGA is allowed to complain about auburn players being bad guys when we pass them in the Fulmer Cup standings. And that ain’t happening. John Ringer, that’s pretty funny. One of the things I’ve been most proud of over the past few years is that Auburn has only had two players make the Fulmer Cup standings. In the all-time standings, we’re tied for 74th and they’re tied for… 3rd. As for the Bammers, they have so many reasons to be scared it’s not even funny. I don’t doubt they’ll score on us as well, but I don’t see them stopping us with God2illa at the helm. Wow, 2xT. I can’t make it past the first minute of that video before the whining gets too obnoxious for me. Obviously, whoever made that video doesn’t know anything about football. Now that I think about it, saying that about a Georgia fan is kind of redundant. 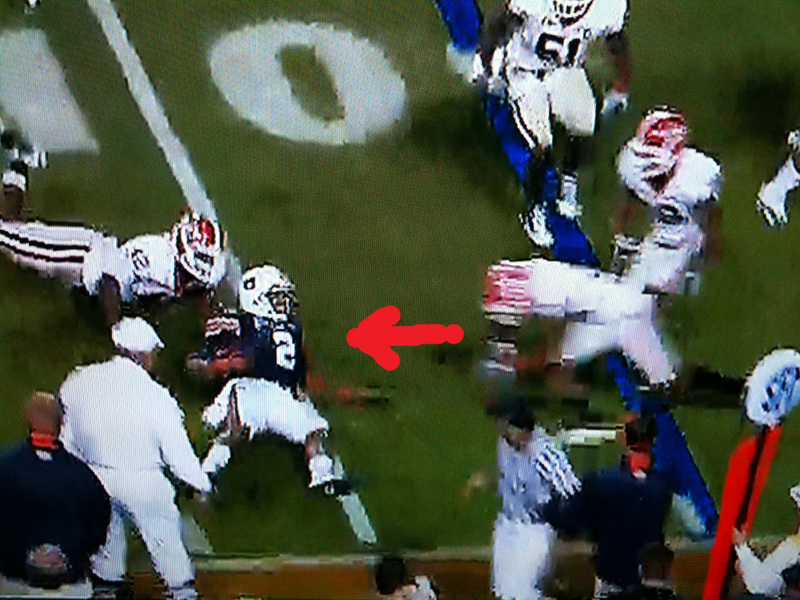 Guys, Fairley could have permanently handicapped the UGa QB. He hit him around the T11-L2 vertebrae and bent his spinal column around his helmet. That could either cause permanent back problems or could have even paralyzed him. For Life. Just because Fairley was getting some ‘revenge’ for the cam spear earlier.